What is the neural basis of human consciousness? This question may seem to be the domain of philosophy, yet it is at the centre of one of the most mysterious and least understood conditions of the human brain: the vegetative state. The consequences of our limited understanding of the phenomenon of human consciousness become apparent when clinicians are called to recognise, on the basis of behavioural tests, whether a patient surviving severe brain injury is aware or not. Novel functional neuroimaging techniques, however, have the potential to open a window on to the mental life of these patients, allowing us to directly assay how much cognition may remain, whether consciousness is preserved, and maybe even yield answers concerning their quality of life. How do we ever know that someone – other than ourselves – is conscious? The answer, as things stand, is that we never really know. In fact, despite centuries of philosophical inquiry and, more recently, decades of scientific research into the subject, we still lack answers to the most fundamental questions. What is consciousness? How and why did we evolve to possess it? How do billions of interacting neurons give rise to it? While much progress has been made in delineating how much (or rather, how little) cognition occurs within the boundaries of consciousness, we still fall short of addressing any of these central questions about its nature. Martha’s eyes are now open. Medically speaking, the return of alternating cycles of sleep and wakefulness mark her progression from coma to a vegetative state (VS: Jennet & Plum, 1972). However, even though Martha’s eyes are open, and even though she gives the impression of ‘seeing’, in fact, she doesn’t. Visual information may well reach several centres of her brain dedicated to processing information from the eyes, and her brain may even respond differently to different categories of objects. Martha, however, doesn't ‘see’, inasmuch as she may not have any awareness of what she is gazing at.Consciousness can be conceptualised as encompassing two cardinal components (Laureys, 2005): its level (i.e. wakefulness) and its content (i.e. awareness). A healthy individual, when not asleep, is both awake and aware. Conversely, at the opposite end of the spectrum, a comatose patient is neither awake nor aware. In between these two extremes, wakefulness and awareness typically appear to vary together. They are both very low during general anaesthesia, and jointly return as one progresses from deep sedation, or deep sleep, to wakefulness. In VS, however, these two dimensions seem to dissociate. Hence, vegetative patients appear to be awake, but are not aware. 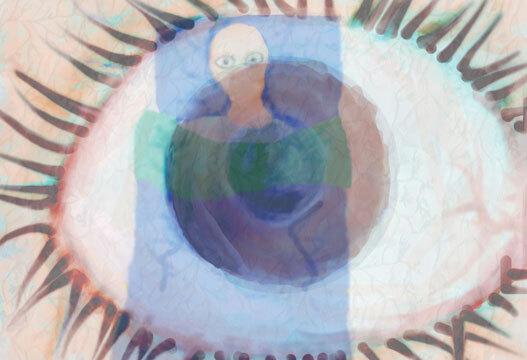 The reverse dissociation occurs naturally during REM sleep, and in particular during oneiric experiences, where a subjective feeling of awarenessis often present despite the state of non-wakefulness. Chances of recovery from VS are negatively linked to time, and to the nature of the injury. Some patients will never make any significant recovery, and will be diagnosed as in permanent VS (in the UK, a permanent VS diagnosis is made after at least six months, for non-traumatic brain injury, and one year, for traumatic ones; Royal College of Physicians, 1996/2003). Other patients, however, do regain some (transient) level of awareness and thus are said to progress to a minimally conscious state (MCS: Giacino et al., 2002). How do we know that a patient has regained consciousness? With no agreed definition of what consciousness is, and with no means to quantify it, all we can do is to search for signs that may reveal its presence. In the medical setting this translates into careful and repeated (albeit subjective) evaluations of the patient’s spontaneous and elicited behaviour, according to specifically developed scales (e.g. JFK Coma Recovery Scale: Giacino et al., 2004; SMART: Gill-Thwaites & Munday, 2004). In particular, assessing the presence of consciousness, and thereby discriminating MCS from VS patients, requires finding evidence of (i) awareness of the self or the environment; (ii) sustained, reproducible, purposeful or voluntary response to auditory, visual, tactile or noxious stimuli; or (iii) language comprehension and/or expression (Multi-Society Task Force on PVS, 1994; Royal College of Physicians, 1996/2003). If any evidence of wilful behaviour is apparent, then the patient is diagnosed MCS. Conversely, where there is no evidence of such behaviour, a VS diagnosis is made. This approach, however, suffers from a major flaw. A positive VS diagnosis ultimately relies on a negative result. Lack of evidence of consciousness is, in this situation, equated to evidence of lack of consciousness. What if a patient were conscious,but unable to produce any motor output? What if a patient could comprehend language, but were unable to speak or produce any other kind of response? How could such an individual ever be distinguished from a vegetative patient? In fact, on the basis of current clinical assessments, it is not logically possibleto differentiate between the two circumstances. Inasmuch as motor behaviour is required to signal a state of consciousness, an aware patient that cannot produce any behavioural output is undistinguishable from an unconscious one (Monti et al., 2009b). This problem undoubtedly contributes to the high rate of misdiagnosis in this group, according to which 40 per cent of (aware) MCS patients are misdiagnosed as VS (e.g. Schnackers et al., 2009). The issue is all the more important when you consider that a VS diagnosis may result in very different medical, legal and ethical decisions than an MCS diagnosis. In the United Kingdom, for example, it is possible, under specific circumstances, for the legal guardian of a permanent VS (but not an MCS) patient to file a request for discontinuation of life-supporting therapies (e.g. hydration and nutrition). If a patient cannot behaviourally manifest her state of consciousness, what other means are there for assessing whether she is aware? In the past 10 years, an increasing number of research studies have highlighted the possibility that functional neuroimaging technology, such as positron emission tomography (PET) and functional magnetic resonance imaging (fMRI), can be used to look directly into the brain for markers of consciousness. Between the late 1990s and the early 2000s, a series of such studies showed that functional neuroimaging could detect cognitive processing in VS patients, well beyond that which is observable in (behavioural) clinical assessments. In two reports, patients that were entirely unresponsive at the bedside, exhibited brain activations similar to healthy volunteers in responseto speech sounds (Owen et al., 2002), and to pictures of faces (Menon et al., 1998). These findings, quite surprising at the time, highlighted the fact that, despite severe brain injury, it is possible to retain relatively high-level cognitive processing. The extent to which brain activity can be used to uncover the integrity of cognitive processes invisible at the bedside has been recently explored more fully in the domain of audition and language comprehension, by Coleman and colleagues (2007). Using a hierarchical approach, two VS patients were found to retain many aspects of linguistic comprehension, from simple discrimination of speech sounds to detecting the presence of semantically ambiguous words. In these two patients, sentences containing ambiguous words (e.g. ‘The shell was fired towards the tank’) elicited strong activation, in left prefrontal-cortex, as compared to sentences containing low ambiguity words (e.g. ‘She wrote her secrets in her diary’). This very same ambiguity effect had been previously documented to occur in healthy volunteers (Rodd et al., 2005). Intriguingly, in anaesthetic studies, this effect appears to vanish as healthy individuals lose consciousness, even at relatively light levels of sedation, suggesting that awareness may be necessary for such response to occur (Davis et al., 2007). With respect to patients, the crucial question is whether we can use brain activity to infer the presence of consciousness. Can brain activity be employed as a substitute for wilful motor behaviour in revealing the presence of consciousness? Does brain activity in response to pictures of faces imply that a patient is aware of them, that she can ‘see’ the faces? If a patient exhibits the same brain response to speech as healthy individuals, does it imply that she understands language? The answer to these questions depends on what type of stimuli are used, and what type of brain activity is elicited. Indeed, much sensory processing is rapid and automatic, and can happen in the absence of any conscious perception. Furthermore, perceiving a set of lines and contours as a coherent face, or a string of utterances as speech (in the case of a familiar language), is not subject to volition. A healthy individual has no choice but to perceive a face as such (excluding sophisticated cases of ambiguity or other ‘artificial’ circumstances). Hence, while very revealing about the level of residual cognitive processing that is present, a simple brain response to stimulation cannot be taken as an unequivocal index of consciousness. Is it possible, then, to distinguish the brain’s automatic response to sensory stimulation from wilful processes? Recent research suggests that, under specific experimental circumstances, it is possible to disentangle the two and thus recognise ‘wilful brain processing’. Imagine, for example, being shown an ambiguous figure that can be interpreted as representing a duck, facing left, or a rabbit, facing right (Jastrow, 1899). While subjective factors may encourage us to spontaneously converge on one of the two interpretations, top-down attentional processes allow us to voluntarily adopt one or the other. Despite the fact that the very same pattern of light is falling on the retina, at some level, the two interpretations of the figure must entail different brain responses. If it were possible to demonstrate that a patient’s brain response to an unchanging pattern of sensory stimulation can change at will, this would necessarily imply the mediation of awareness. In short, in an experimental design in which two tasks are identical in terms of sensory stimulation and only differ according to the ‘mind-set’ required, differential brain responses can demonstrate the ability to voluntarily adopt such ‘mind-sets’, something that requires a state of awareness. Under these circumstances, then, voluntary brain activity can be viewed as a form of non-muscle-dependent behaviour that, like voluntary motor behaviour, signals the presence of awareness (Owen & Coleman, 2008). In one striking application of this idea, a patient who failed to exhibit any voluntary behaviour when tested at the bedside, and was therefore diagnosed VS, was shown to be able to voluntarily modulate brain activity by producing different kinds of mental imagery (Owen et al., 2006). When tested with fMRI, the patient was asked to imagine playing tennis and, at a different time, to imagine walking around the rooms of her home. Importantly, while the patient was instructed to sustain the imagery for periods of 30 seconds, the only sensory stimulation in the experiment was a one-second long aural cue instructing the patient to focus on one of the imagery tasks or the other. Strikingly, despite being unable to produce any type of wilful motor behaviour to demonstrate that she was conscious, the patient could produce wilful ‘brain behaviour’ by up- and down-modulation of her brain activity, in a manner that confirmed that she was engaging in the two imagery tasks (see figure above). Testing in healthy volunteers revealed that unless a participant has understood the task instructions and has decided to comply with them, no brain activity is observed (Owen et al., 2007). This latter finding entirely discounts the possibility that the patient’s brain activity may have reflected an automatic response. In a similar vein, we have recently described a novel paradigm in which a listener is presented with a series of neutral (i.e. not emotionally salient) words, and alternatively instructed to either listen passively to the words, or to count the number of times a given target word is repeated. Importantly, the perceptual stimulation in the ‘passive listening’ and the ‘counting’ tasks are matched in terms of types of words used, their number and repetition. Yet, when a patient with severe brain injury underwent the procedure, the counting task revealed activation in fronto-parietal regions typically associated with detecting targets and working memory (Montiet al., 2009a). Unless the patient had understood the instructions, had decided to cooperate, and retained a level of cognitive processing sufficient to perform the task, how could the same stimuli have led to systematically different activations? Until we develop quantitative tools that can directly measure consciousness, we are likely to remain bound by having to inductively infer others’ self-awareness ‘by their appearance and by their acts’. Non-invasive neuroimaging methods, however, are now beginning to allow us to redefine the meaning of ‘appearance’ and ‘acts’ to include non-muscle-dependent ‘brain acts’. Indeed, functional neuroimaging can be used to allow aware, but non-responsive, patients to convey their state of consciousness without relying on muscle-dependent behaviour. Furthermore, functional MRI techniques are now being used to access thoughts and intentions (e.g. deCharms, 2007). For example, several recent studies have shown that what someone is viewing, recalling, and even intending to do, can be ascertained solely by observing patterns of brain activity. These advances suggest that very soon it may be possible to directly explore the inner thoughts of behaviourally non-responsive patients. Perhaps, these techniques could even be used to createa simple ‘language’ in which discrete patterns of brain activation are used, like single words, to convey definite content (e.g. ‘yes’, ‘no’, ‘I am in pain’) thereby allowing non-responsive patients to interact with their environment, and express their thoughts and wishes. The possibility of using fMRI for the detection of awareness in the vegetative state raises a number of issues for legal decision making relating to the prolongation, or otherwise, of life after severe brain injury. According to the Royal College of Physicians, ‘one cannot ever be certain that a patient in the vegetative state is wholly unaware… in view of this small but undeniable element of uncertainty, it is reasonable to administer sedation when hydration and nutrition are withdrawn to eliminate the possibility of suffering, however remote’. At present, decisions concerning life-sustaining intervention (nutrition and hydration) are made only once a diagnosis of permanent vegetative state has been made. In cases in which the critical threshold for a diagnosis of permanent vegetative state has passed, the medical team formally review the evidence and discuss the patient’s premorbid wishes with those closest to the patient. In England and Wales, the courts require that a decision to withdraw nutrition and hydration should be referred to them before any action is taken; this is not the case in the United States or in many other countries, where such decisions are often made between doctors and the patient’s family. Whether fMRI will ever be used in this context remains to be seen. Certainly, if evidence for awareness were to be found in a patient who had progressed beyond the threshold for a diagnosis of permanent vegetative state, this fact would surely have profound implications for this decision-making process. On the other hand, neuroimaging data would need to be treated cautiously where negative findings were found. False-negative findings in functional neuroimaging studies are common, even in healthy volunteers, and they present particular difficulties in this patient population. For example, a patient might fall asleep during the scan or might not have properly heard or understood the task instructions. Accordingly, negative fMRI results in vegetative patients do not necessarily imply impaired cognitive function or lack of awareness, and such findings should be interpreted with caution. Coleman, M.R., Rodd, J.M., Davis, M.H. et al. (2007). Do vegetative patients retain aspects of language? Evidence from fMRI. Brain, 130, 2494–2507.Davis, M.H., Coleman, M.R., Absalom, A.R. et al. (2007). Dissociating speech perception and comprehension at reduced levels of awareness. Proceedings of the National Academy of Sciences of the United States of America, 104, 16032–16037. deCharms, R.C. (2007). Reading and controlling human brain activation using real-time functional magnetic resonance imaging. Trends in Cognitive Sciences, 11, 473–481. Giacino, J.T., Ashwal, S., Childs, N. et al. (2002). The minimally conscious state: Definition and diagnostic criteria. Neurology, 58, 349–353. Giacino, J.T., Kalmar, K. & Whyte, J. (2004). The JFK Coma Recovery Scale-Revised. Archives of Physical Medicine and Rehabilitation, 85, 2020–2029. Gill-Thwaites, R. & Munday, R. (2004). The Sensory Modality Assessment and Rehabilitation Technique (SMART). Brain Injury, 18, 1255–1269. Jastrow J. (1899). The mind’s eye. Popular Science Monthly, 54, 299–312. Jennett, B. & Plum, F. (1972). Persistent vegetative state after brain damage. RN, 35, ICU1–4. Laureys, S. (2005). The neural correlate of (un)awareness: Lessons from the vegetative state. Trends Cognitive Science, 9, 556–559. Menon, D.K., Owen, A.M., Williams, E.J. et al. (1998). Cortical processing in the persistent vegetative state revealed by functional imaging. Lancet, 352, 200. Monti, M.M., Coleman, M.R. & Owen, A.M. (2009a). Executive functions in the absence of behavior: Functional imaging of the minimally conscious state. Progress in Brain Research, 117, 249–260. Monti, M.M., Coleman, M.R. & Owen, A.M. (2009b). Neuroimaging and the vegetative state: Resolving the behavioral assessment dilemma? Annals of the New York Academy of Science, 1157, 81–89. Multi-Society Task Force on PVS (1994). Medical aspects of the persistent vegetative state. New England Journal of Medicine, 330, 1499–508. Owen, A.M., Coleman, M.R., Boly, M. et al. (2006). Detecting awareness in the vegetative state. Science, 313, 1402. Owen, A.M., Coleman, M.R., Boly, M. et al. (2007). Response to comments on ‘Detecting awareness in the vegetative state’. Science, 315, 1221c. Owen, A.M., Menon, D.K., Johnsrude, I.S. et al. (2002). Detecting residual cognitive function in persistent vegetative state (PVS). Neurocase, 8(5), 394–403. Rodd, J.M., Davis, M.H. & Johnsrude, I.S. (2005). The neural mechanisms of speech comprehension: fMRI studies of semantic ambiguity. Cerebral Cortex, 15, 1261–1269. Royal College of Physicians (1996, updated 2003). The vegetative state. London: Author. Schnakers, C., Vanhaudenhuyse, A., Giacino, J. et al. (2009). Diagnostic accuracy of the vegetative and minimally conscious state. BMC Neurology, 9, 35.